Dry eyes, also known as dry eye syndrome, occurs when your tears are not providing enough lubrication for your eyes. This can cause a lot of discomfort and produce several signs and symptoms. Some signs and symptoms of dry eyes are a stinging or burning sensation in the eyes, stringy mucus in or around your eyes, sticking together of eyelids when wakin up, increased sensitivity to light, redness in the eyes, a sensation of having something in the eyes (especially when wearing contact lenses), difficulty driving at night, and blurred vision or eye fatigue. Dry eyes can be caused by both medical and environmental factors. Usually, dry eyes are caused by a lack of adequate tears. Not tears from crying, but rather the tears produced by tear glands to keep the surface of your eyes smooth and clear, as well as helping protect your eyes from infection. 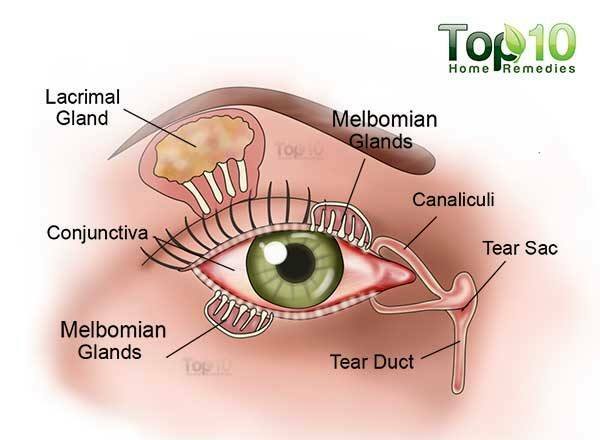 Your tear glands may produce inadequate tears as a result of aging, a medical condition (diabetes, rheumatoid arthritis, lupus, scleroderma, thyroid disorders and vitamin A deficiency), certain medications, laser eye surgery and tear gland damage from inflammation or radiation. 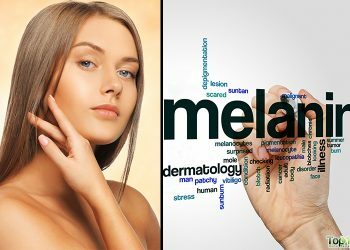 At times, an increase in tear evaporation or an imbalance in the makeup of your tears can also cause this problem. This can be due to exposure to wind, smoke or dry air; hot blowing air; high altitude; reduced blinking while concentrating on some work like while driving or working at a computer; and some types of eyelid problems. Certain risk factors can increase your chance of having dry eyes. 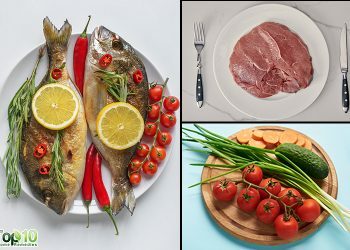 These include being older than 50, being a woman (due to hormonal changes), chronic allergies, sleeping with your eyes partly open, wearing contact lenses, eating a diet that is low in vitamin A and omega-3 fatty acids. If left untreated, dry eyes can lead to complications like increased risk of eye infections and damage to the surface of your eyes. There are many simple home remedies you can use to deal with this uncomfortable eye problem in a natural way. If you choose to use eyedrops (artificial tears), gels or ointments to treat dry eyes, it is best to consult your doctor first. 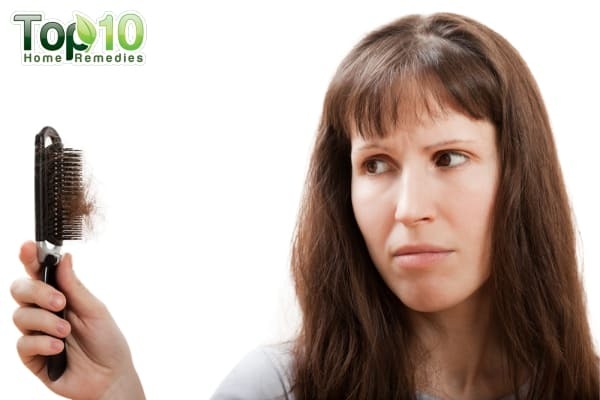 Here are the top 10 ways to get rid of dry eyes naturally. People with dry eyes tend to constantly rub their eyes, which should be avoided to reduce inflammation. To relieve this discomfort and maintain proper eye hygiene, it is recommended that you wash your eyelids a few times a day. Put a few drops of baby shampoo on your clean fingertips. With your eyes closed, gently massage your eyelids near the base of your eyelashes. Rinse the soap completely from your eyelids using lukewarm water. A very comfortable way of dealing with dry eyes is using a warm compress. 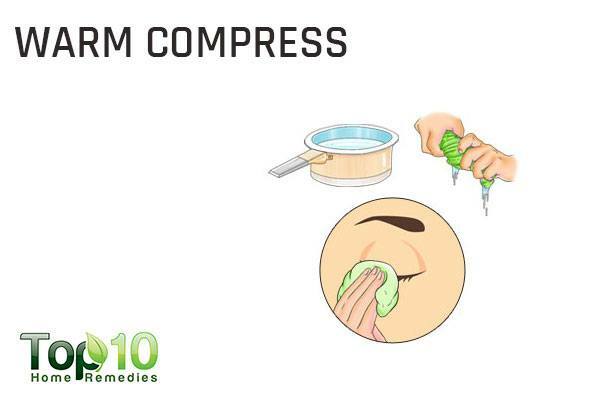 The heat from the compress increases blood circulation to the area and promotes the formation of tears. It will also soothe eye irritation and provide relief from the symptoms. Soak a clean, lint-free cloth in hot water and wring out the excess water. Hold this warm, moist cloth over your closed eyelids for up to 10 minutes at a time (not more than that). Be sure to rewet the cloth with warm water when it cools. Use this treatment at least twice daily until your symptoms subside. Note: When using a compress for your eyes, maintain a temperature of 108 degrees Fahrenheit and do not go above it. 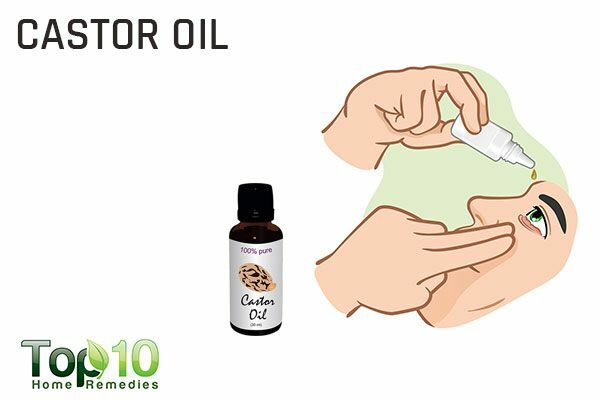 Castor oil also helps reduce symptoms of dry eyes. 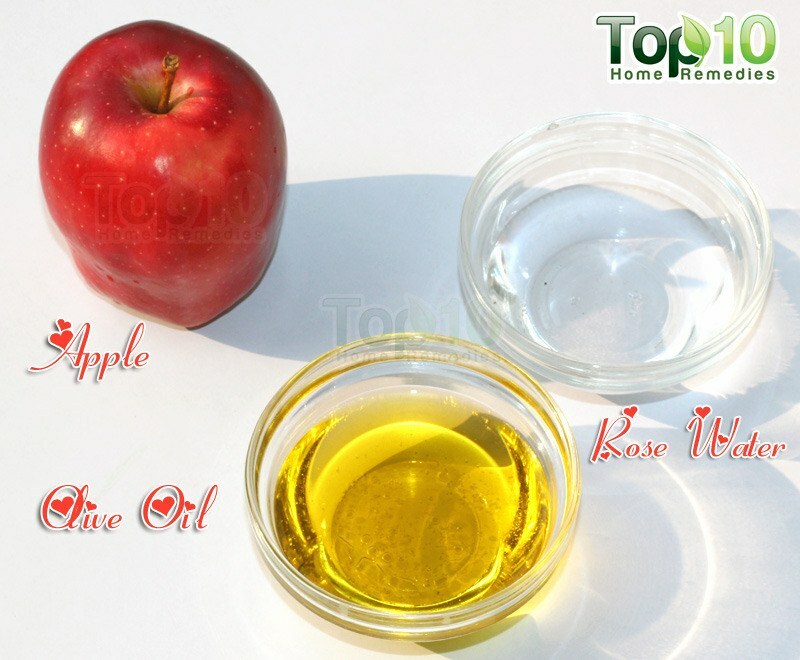 The ricinoleic acid in the oil works as an anti-inflammatory agent that helps relieve itching, irritation, burning and pain associated with the condition. The oil can also help reduce tear evaporation. A 2002 study published in Ophthalmology reports that castor oil eyedrops are effective and safe in the treatment of meibomian gland dysfunction, one of the causes of dry eyes. Another study published in 2007 in Cornea analyzed the efficacy of a 1.25 percent castor oil emulsion and a 0.32 percent hypromellose solution on the tear physiology of patients with mild to moderate dry eye. 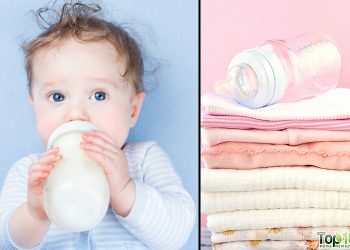 Researchers found that the oil-water emulsion was more effective in reducing tear evaporation than the hypromellose after repeated application over one month. Buy pure, organic, hexane-free castor oil. Using an eye dropper, place one drop of it in each eye. Repeat twice daily to keep your eyes moisturized and reduce redness. Dry eyes can be due to a lack of essential fatty acids in your diet, especially omega-3 fatty acids. Omega-3s help reduce inflammation in the body and also stimulate tear production and higher quality tears. In addition, these fatty acids are an important component of fat molecules, which keep your eyes healthy. A 2013 study published in the International Journal of Ophthalmology concludes that omega-3 fatty acids have a positive role for dry eye syndrome as well as in certain medical conditions, such as blepharitis and meibomian gland disease. 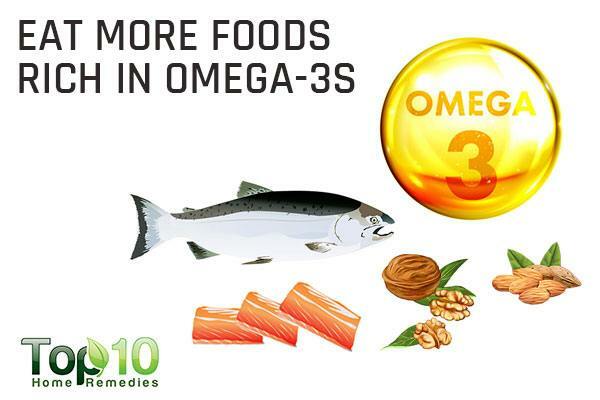 Include foods rich in omega-3 fatty acids in your diet. Good sources of this nutrient include fatty fish and fish oils, ground flaxseed and flaxseed oil, chia seeds, sesame seeds, almonds, and walnuts. You can also take omega-3 supplements, after consulting your doctor. 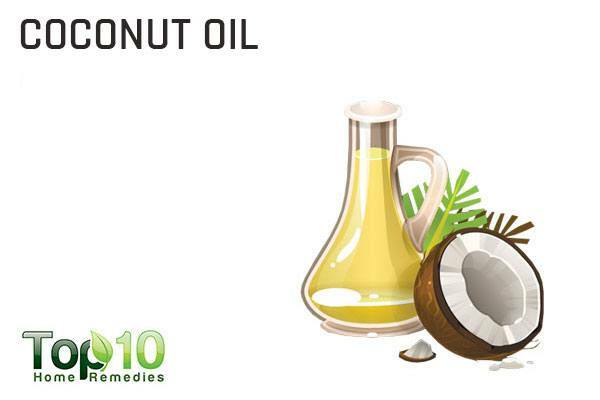 Coconut oil can act as a rewetting agent for your eyes and play a key role in reducing the symptoms of dry eyes. While the composition of fatty acids in it helps a lot, it also acts as a protective layer over the tear film layers to help reduce tear evaporation. Plus, it has anti-inflammatory properties that help reduce the discomfort caused by dry eyes. A 2015 study published in Evidence-Based Complementary and Alternative Medicine concludes that virgin coconut oil acts as safe rewetting eyedrops and shows no significant difference in the measurable parameter compared to commercial brand eyedrops and saline. However, further investigation should be done to determine its efficacy for dry eye therapy. Soak a cotton ball in coconut oil. Place it directly on your closed eyelids for 15 minutes. Use this remedy at regular intervals throughout the day. Also use coconut oil to do oil pulling, daily in the morning on an empty stomach to remove toxins from your body that could be contributing to dry eyes. Regular blinking can improve the flow of tears to help moisten the eyes and also spread the tears to the sides of the eyes. This in turn will reduce your symptoms of dry eyes. It will also improve blood circulation to the eyes and reduce eyestrain. In fact, each blink brings nutrients to the eyes’ surface structures, keeping them healthy. Perform this blinking exercise 5 times at least every hour for a couple of weeks. You can then reduce the frequency to at least 4 times a day. Then, squeeze the eyelids together and again count till 2. These full blinks will help wash your eyes fully with a fresh layer of tears. Also, make a conscious effort to blink your eyes more often when using your computer or mobile devices. Apply the 20/20/20 rule, that is, for every 20 minutes of screen time, look at something that is at least 20 feet away for at least 20 seconds. 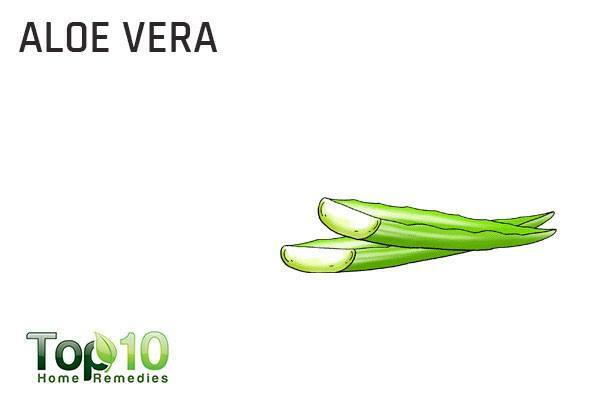 Due to its alkaline nature, aloe vera gel works as an effective home remedy for dry eyes. Its moisturizing property is very helpful in this regard. Also, its anti-inflammatory property helps reduce redness, swelling and inflammation. Put the gel on a piece of tissue and gently wipe it on the outside of your eyelids. Note: Do not put aloe vera gel directly in your eyes. 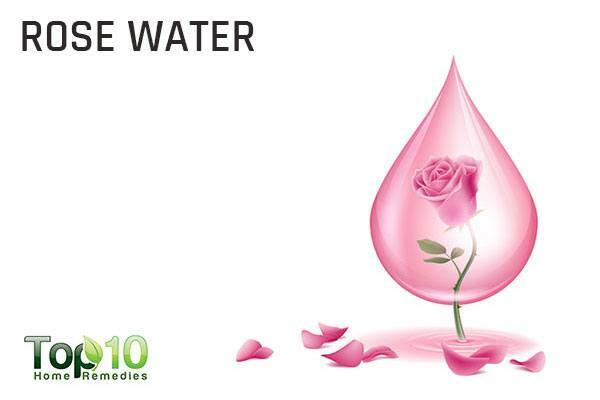 Rose water is another very effective remedy for dry eyes. It works as a natural relaxer for strained and tired eyes, which can lead to poor formation of tears. Plus, rose water contains vitamin A, the deficiency of which is linked to dry eyes. Dip a piece of cotton cloth or a cotton ball in rose water and apply it on your closed eyelids. Leave it on for about 10 minutes. Repeat 2 or 3 times a day. Another option is to rinse your eyes out with pure rose water or use pure rose water as eyedrops for instant relief. Do this 2 or 3 times a day. Using a humidifier, especially in the winter months, can help prevent dry eyes. The central heating system in your home and office often dries the air out, which can aggravate dry eye symptoms. 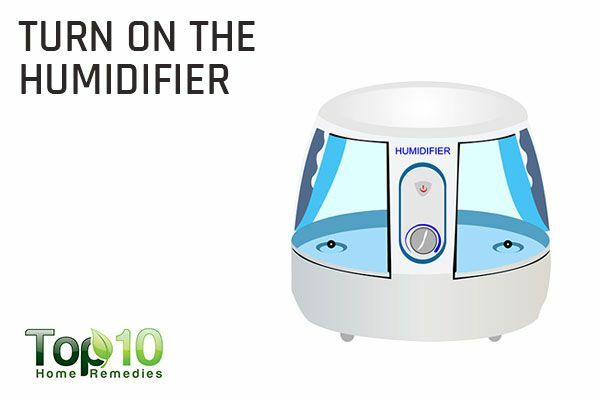 Hence, try using a humidifier to add some moisture back into the air. This in turn will provide moisture for your eyes. Turn on the humidifier or else put on pan of water in fron of your heat vent as a good substitute for a commercial humidifier. You can also put plants in the room to add moisture to the air through transpiration. Some of the best plants for this purpose are the areca palm, peace lily, and Boston fern. These plants also help purify the air by absorbing the indoor air pollutants. To stimulate the tear glands to help prevent dry eyes, regular massage of the eyelids is also beneficial. Massage will even improve blood circulation to the eyes and relax the muscles around your eyes. Put a few drops of olive oil or coconut oil on your fingertips. 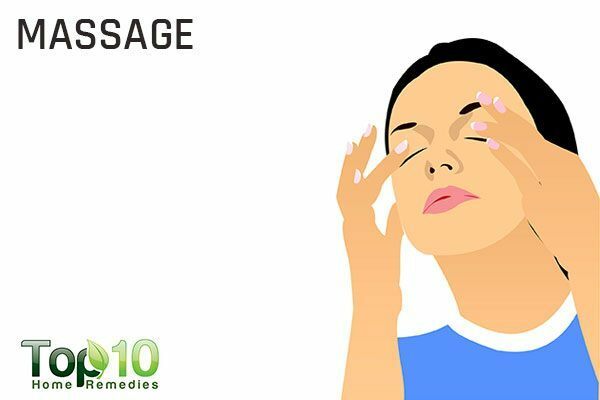 Gently rub the oil over your closed eyelids and massage for a couple of minutes. Then, place your palms over your eyelids and cover them completely for another few minutes. You need not rinse the oil from your eyelids as it will be absorbed. Dehydration is one of the most common causes of dry eyes, so increase your fluid intake to keep your body hydrated and reduce symptoms. Take frequent breaks during computer use. Frequent reading and TV watching can also dry out your eyes, so it’s important to take breaks to regain the lost moisture. Avoid blowing air directly into your eyes while using hair dryers, car heaters, air conditioners or fans. Avoid dry environments, indoors and outdoors, as dry air acts as an irritant. Try using wraparound sunglasses or other protective eyewear to block wind and dry air. Also, use appropriate eyewear to protect your eyes from wind when riding a bike or motorcycle. Frequently close your eyes for a few minutes when exposed to dry air at high altitudes, in desert areas and in airplanes. Stop smoking and avoid exposure to secondhand smoke. Try to stay indoors when it’s windy. When it comes to sunglasses, always wear quality sunglasses that block 100 percent of the sun’s ultraviolet (UV) rays. As it it is acidic, excessive coffee intake can intensify dry eyes in many cases. So, so limit your intake. Acidic foods can aggravate dry eye symptoms, so avoid such foods until your symptoms are gone completely. Treat eyelid conditions, such as blepharitis, meibomian gland dysfunction or other eyelid conditions, to treat dry eyes. Discontinue or reduce your use of contact lenses if it is causing dry eye symptoms. You can even try acupuncture therapy to deal with dry eye symptoms. At the end of the day, do not forget to remove all traces of eye makeup from your lids and lashes. wonderful article, probably one of best I have read recently. Great tips, thank you very much. Great articles, thank you very much. Thanks for each and every good and helpful information.hope to hear more good info. further. Great blog! its very informative. I just did the blinking exercise and it seems to help – will try for a few weeks 🙂 thank you very much!! Will definitely try these relatively easy and useful remedies. Am almost sure they will help especially after trying out the Blinking Exercise. Thank you very much!!! I just did the blinking exercise, and it has helped. My eyes were so bad that I had to go to the eye unit at my local hospital earlier this week. Thank you very much for these excellent tips. I have tried everything and you should know that Omega 3 didn’t help at all- it is Omega 7 plus carotenoids, specifically Sea Buckthorn Berry that has made all the difference. I can now open my eyes without pain. I respectfully suggest to scientists that they publish studies on Omega 7!